The Schaghticoke First Nations and The Watershed Center invite you to join us for a very special evening of stories, sharing, ceremony and connection with Great-Grandmother Mary Lyons (Ojibwe/First Nations) and Grandmother Doreen Bennett (Maori-Whanganui). The Water Protector Grandmothers will be in conversation with Sachem HawkStorm on the spirit of oneness, the connection between all living beings, the need to rise up and protect the sacred elements and all of life. Grandmother Mary Lyons is a Water Carrier and Ojibwe Elder from Minnesota. Beyond traveling and teaching internationally, sometimes in collaboration with the Indigenous Grandmothers of the Sacred WE, she is working to bring justice for dozens of missing and murdered indigenous women in her region. She is the author of the Wisdom Lessons: Spirited Guidance from Ojibwe. Grandmother Doreen of the Maori-Whanganui tribe, visits us all the way from Aotearoa, New Zealand. This past March the Whanganui succeeded in securing the rights for their sacred Whanganui River to be protected under laws extended to a person. Sachem HawkStorm is chief of the Schaghticoke First Nations of our region, tireless activist, and the host of Beyond the 7th Fire on Kingston Radio WKNY. 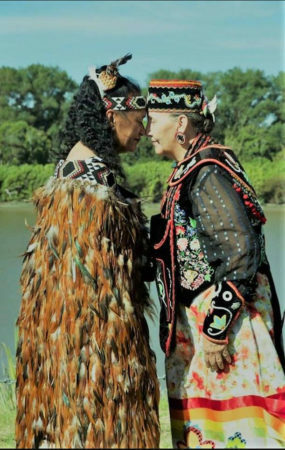 We ask for donations of $20-100 to support the work of these Watershed Protector Grandmothers.